Join Time Team favourite Phil Harding and expert guide Pat Shelley for a unique exploration of the Stonehenge landscape at the exclusive Council for British Archaeology (CBA) and English Heritage (EH) members’ event on Sunday 19th April 2015. Visit the Council for British Archaeology Website for full details. •The Cafe and Shop at the new Visitor Centre at Airmans Cross should be opening for visitors from approximately 0800h on the morning of Saturday 21st March. Please note that the toilets at this location will also become available for use at this time. Although the Cafe will be opening only hot and cold drinks will be available for the first hour. Pasties etc will become available after 0900h. 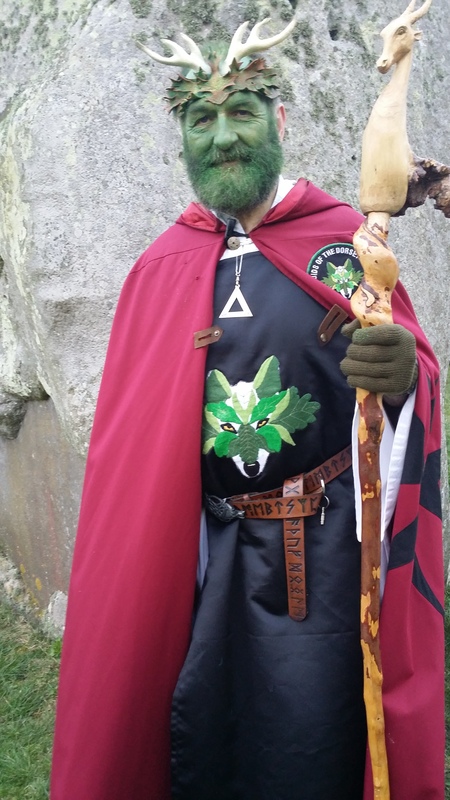 There will be no access to Stonehenge via the A344. Accessible parking is extremely limited and is booked on a first-come-first-served basis. Please apply to lucy.barker@english-heritage.org.uk. Accessible parking opens at 5am. The Stones of Stonehenge. 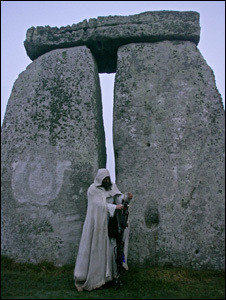 A new web site with a page devoted to each stone at Stonehenge. Strange as it may seem, there isn’t a useful reference work that shows photographs of every stone at Stonehenge from all (easily) available angles, until now. The website is a work in progress toward that end. Not all stones currently have pages, but eventually they will have. The HeelStone (or HeleStone or HealStone) is a natural stone that has not been worked or tooled. by researchers and archaeologists to this day. Petrie carried out one of the first highly (and dependably) accurate surveys of Stonehenge and decided that all previous systems of numbering the stones were inadequate in one way or another. He resolved to number the stones in ascending order clockwise from the main axis of the monument and beginning with the sarsen immediately to the east of the axis in the outer circle as seen from the centre. This is Stone 1. All the actual and supposed positions of sarsen stones are numbered, whether or not there is a stone (or fragment of stone) at or near the position. The horizontal lintels of the outer sarsen circle are numbered by adding 100 to the number for the higher of the two uprights that support each one. So the lintel supported by Stones 4 and 5 is numbered 105, and that supported by Stones 21 and 22 is numbered 122. There is a single exception to this rule for the lintel spanning Stones 30 and 1 across the main entrance into the monument which is numbered 101 rather than 130. This is because the number 130 is already in use for the neighbouring lintel that is supported by Stones 29 and 30. The bluestones of the circle within the sarsen circle are similarly numbered clockwise from the main axis beginning with Stone 31. In the case of the bluestones, Petrie did not assign numbers to the supposed positions of any that are missing. The sarsens in the horseshoe of massive trilithons are numbered clockwise starting from Stone 51 round to Stone 60. Their respective five lintels (or “imposts” as Petrie called these huge lintels) are numbered 152, 154, 156, 158 and 160. The bluestones of the innermost horseshoe arrangement are numbered clockwise from Stone 61. The Altar Stone is Stone 80. The two remaining Station Stones outside the circle are numbered 91 (eastern stone) and 93 (western stone). Station Stones 92 and 94 are missing. The Slaughter Stone is Stone 95 and the Heel Stone is Stone 96. Fragments of stones which are clearly associated with each other are given alphabetical indices, for example Stones 55a and 55b are the two parts of the broken fallen sarsen upright of the Great Trilithon. 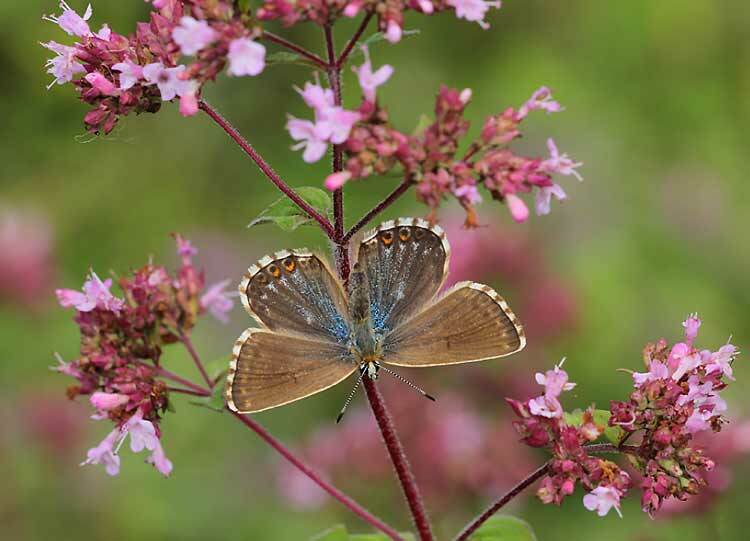 RSPB creates wildflower meadow for butterflies at Stonehenge World Heritage Site. Hundreds of wildflowers have been planted at Normanton Down on the Stonehenge World Heritage Site to help gives butterflies a home during the summer months. Flowers such as classic chalk grassland herbs, common rockrose and wild thyme are among many more that make up the wildflower meadow that was created on four iron-age barrows across the ancient site. The wildflowers, which were all grown from seed and collected from Salisbury Plain, will serve as a food source for the caterpillars of the iconic chalk downland butterfly and many pollinators during the summer season. The work for the project was completed by the RSPB, who manage the Normanton Down nature reserve, which is known for its ground nesting birds and downland wildlife. Chalkhill Blue – female © Tony Davison, from the surfbirds galleries. The wildflower planting was funded by the Heritage Lottery Fund as a part of ‘Save Our Magnificent Meadows’ project, which is a national partnership of 11 organisations led by Plantlife to help transform the fortunes of vanishing meadows, grasslands and wildlife. Through the RSPB’s Giving Nature a Home campaign, you can help tackle the housing crisis facing the UK’s threatened wildlife. The charity is asking people to provide a place for wildlife in their own gardens and outside space – whether it’s a dead wood pile for mini beats and other insects, putting up a nestbox for a house sparrow, or creating a pond that will support a number of different species. 2. Giving Nature a Home is the RSPB’s latest campaign, aimed at tackling the housing crisis facing the UK’s threatened wildlife. The charity is asking people to provide a place for wildlife in their own gardens and outside spaces – whether it by planting pollen-rich plants to attract bees and butterflies, putting up a nestbox for a house sparrow, or creating a pond that will support a number of different species. The charity hopes to inspire people across the UK to create a million new homes for nature. 3. Normanton Down lies within the Stonehenge World Heritage Site, and comprises 47 ha of former arable land in the process of being reverted to species-rich chalk grassland, through a management agreement with the private owner. Reseeding of the arable land has taken place over the last three years, and the diversity of wild flowers, along with butterflies and other invertebrates, is gradually increasing. The site is also being managed to encourage breeding stone-curlews and other birds such as lapwings and corn buntings. 4. The wildflowers that are being planted on the site are; the classic chalk grassland herbs; kidney and horseshoe vetch, common rockrose, wild thyme, dropwort, harebell, small scabious and devil’s-bit scabious. 5. Iconic downland butterflies expected on the site include; chalkhill blue, adonis blue, brown argus and marsh fritillary. 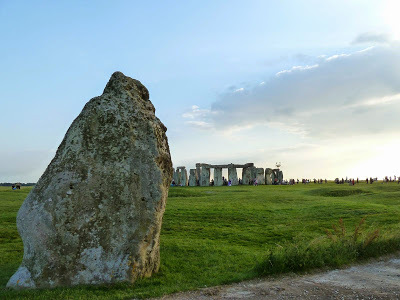 Tags: english heritage, iron-age barrows, National Trust, nature reserve, Normanton Down, RSPB, Salisbury Plain, Stonehenge Landscape Walk, Stonehenge news, Stonehenge World Heritge Site.